There is a lot to be said for professional parking lot striping. Your parking lot is the first thing new and existing customers see when visiting your location. When they pull into your parking lot, it is the start to their overall experience and sets the first impression. Professional asphalt striping will help to direct both foot and vehicular traffic flow. Pavement striping also makes sure your parking lot space is utilized to its full potential and designates necessary areas such as loading zones, handicapped and wheel chair accessible areas, pedestrian crossing and any other aspect you’d like labeled. To keep your parking lot in prime condition, professional seal coating and asphalt striping should be maintained on a regular basis. Seal coat services are recommended approximately every 3 years where as pavement striping tends to fade quicker from heavy traffic flow, UV rays and weather. The Americans with Disabilities Act (ADA) affects every property owner. The ADA regulation requires the proper number of handicapped-accessible parking stalls, proper markings and signage. If you’re not sure whether your property is ADA compliant, contact Armored Sealcoating to find out. Our pavement striping specialists will inspect your property and make sure you avoid expensive fines and penalties by meeting ADA standards. Armored Sealcoating is your best choice seal coating company for professional asphalt striping services. 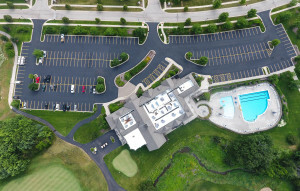 We will make sure your investment lasts with quality materials and paint, prolong the life of your pavement with superior seal coat services, fill in the cracks between services (literally) with professional crack filling services and keep your commercial parking lot looking great. Let us provide your estimate for services in and around Kenosha County, including Pleasant Prairie, Somers, Paddock Lake, Trevor, Twin Lakes, Lake Geneva and surrounding areas.